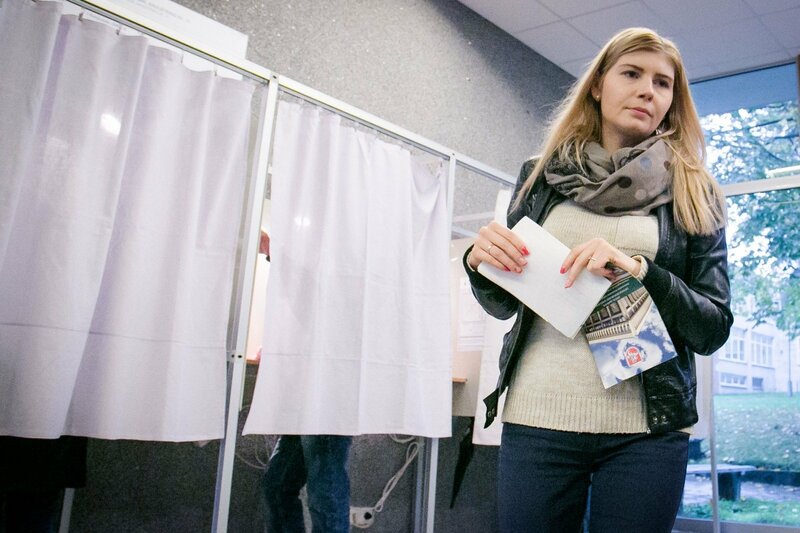 The first round of Seimas elections in the single-mandate electoral districts only elected three members of Seimas. The remaining 68 districts will be voting on October 23 in a second round. It will feature the two candidates with the highest vote count in each district. Meanwhile former Minister of Finance, Conservative (TS-LKD) candidate Ingrida Šimonytė in Antakalnis and Polish Electoral Action (LLRA-KŠS) representatives Leonardas Talmontas and Česlavas Olševski confidently stepped into Seimas in the first round. Unexpectedly, the second round will feature PM Algirdas Butkevičius competing for a seat in Seimas, despite having easily cruised into victory in previous elections. A similar procedure awaits Conservative leader Gabrielius Landsbergis, who was unable to enter Seimas within the first round in one of the Kaunas districts. ELECTIONS. Who will form a coalition and who will take the most desirable posts? Info TV spoke to the director of TSPMI (Institute of International Relations and Political Science) Ramūnas Vilpišauskas, who stated that the second round can feature somewhat unexpected results, however both the leading parties (the Conservatives and the “Peasants”) have practically identical starting positions in the lead up to the second round of voting. “The starting positions are really similar because they have a similar number of candidates in the second round and their chances are roughly equivalent; added together the two political entities could have around 80 mandates in Seimas,” said the head of TSPMI. The political scientist believes that a large factor in who will win the second round is how many voters turn up because voter turnout in second rounds is usually significantly smaller. Vilpišauskas notes that low turnouts are more beneficial to the Conservatives because voters from other political parties will be more inclined to vote for “Peasant” candidates. While the head of TSPMI expects easy victories for G. Landsbergis and R. Karbauskis, he expects that the current PM’s duel may turn interesting. “I believe that J. Dagys’ chances against R. Karbauskis in the second round in the Šilainiai district are fairly limited. I agree, Mr. Karbauskis has more chances here,” observed Vilpišauskas. Will the incumbent head of cabinet defeat the wrestler? The Vilkaviškis district has long been a bastion of current PM Algirdas Butkevičius, but on October 9th he was clearly stuck. Having earned 36.23% of the vote in his district, the PM was far from his earlier records and will have to face “Peasant” candidate, professional wrestler K. Smirnovas, whose victory party leader Karbauskis is confident in. The head of TSPMI believes that in this case, the PM’s chances are not quite as good as they may appear, the two candidates could in fact be equal. “On one hand that “Peasant” popularity could have an impact in this district, those who voted for others could support this candidate simply because they wish to vote in a new face. That said the PM led the first round, so his chances should not be underestimated. I would say it’s a 50/50,” said the expert. Naujamiestis – a confident victory for a former ambassador? The Vilnius Naujamiestis district where a number of well-known politicians faced off resulted in a duel between Conservative Ž. Pavilionis and Olympic champion, Liberal V. Alekna. The prediction is easier here, notes R. Vilpišauskas; the Conservative should enter Seimas. “I think it can be predicted more firmly here, Ž. Pavilionis should win. He worked hard, was one of the most active candidates, started his campaigning long ago and is well known among expatriate Lithuanians. V. Alekna is famous in his own right, but as a sportsman, not a politician. Nevertheless he appears to be a decent person, albeit lacking political experience,” summarised Vilpišauskas. The Vilnius Senamiestis (Old Town) district will feature a showdown between Conservative M. Majauskas and former mayor A. Zuokas, whose party is currently at the very bottom of the party ratings. R. Vilpišauskas states that the former mayor’s chances are limited and the 16% of the vote he gathered in the first round are unlikely to rise, which he needs to take a win in the second round. “I believe that Zuokas’ chances of increasing his support base are limited, but we need to remember that the Conservatives do not have much space to attract further voters either. Still I would predict a victory for Majauskas, perhaps by a narrow lead, but his chances are still somewhat greater,” said Vilpišauskas. A “Peasant” to dethrone Sabatauskas from his district? For a long time Social Democrat J. Sabatauskas has been dominant in the Alytus district, but this time he has received a challenge from “Peasant” R. Šarkinickas, who took 27% of the vote in the first round and led the Social Democrat by ten percent. It is of note, that Šarkinickas is a defector from TS-LKD. “It is hard to predict. It is unclear how TS-LKD voters view him. Since in the regions, single-mandate districts are where a personal touch matters, it could be that many will support him and will not be inclined to vote for the Social Democrats because Conservative voters rarely vote for Social Democrats and vice versa. In this case I fear that J. Sabatauskas’ chances of winning here are not big,” said the head of TSMPI, noting that it is nevertheless very difficult to predict in this case. Centras-Žaliakalnis district – a confident victory awaits Landsbergis? There were many who though that Landsbergis could win in the first round, however the Conservative leader failed to gather enough votes and will have to face off against the a “Peasant” candidate in the second round. R. Vilpišauskas believes that the second round should not pose any large challenge to the Conservative and expects him to win. One of the closest fights awaits in the Petrašiūnai district where former Minister of Agriculture K.Starkevičius will face “Peasant” candidate G. Vasiliauskas. R. Vilpišauskas notes that it is exceedingly hard to predict in this case, with both politicians having roughly equal chances. The Panemunė district will feature a showdown between “Peasant” A. Veryga and Conservative T. Langaitis. The fighting is expected to be fierce and hard to predict, with R. Vilpišauskas noting that “Once again similar chances. While T. Langaitis performed well in the first round, it is unlikely he has enough reserves for the second, so both politicians have even chances,” said R. Vilpišauskas.